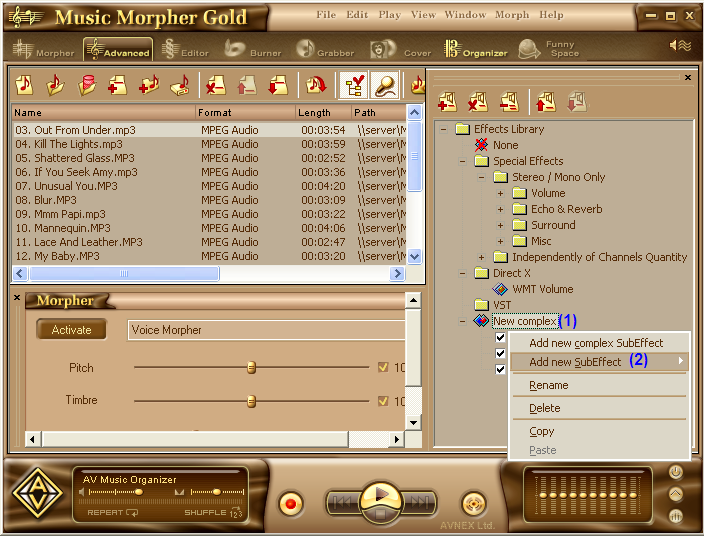 AV Music Morpher Gold 4.0 is a full software package of powerful music tools including a multi-track recorder and editor, a whole suite of professional effects to improve your favorite songs, our famous patented vocals and music remover-extractor, etc. AV Music Morpher Gold 4.0 turns your humble PC into a multi-channel digital audio workstation which holds the power to help you create your own pop songs, funky remixes or even backing tracks and then improve their quality quickly and easily. When you've finished your masterpiece there's a ready-to-use CD burner so your favorite songs to CD and share them with your friends. In this tutorial, we demonstrate how to use the advanced effects of Music Morpher 4.0 to improve the quality of a song, recording or music clip, etc. 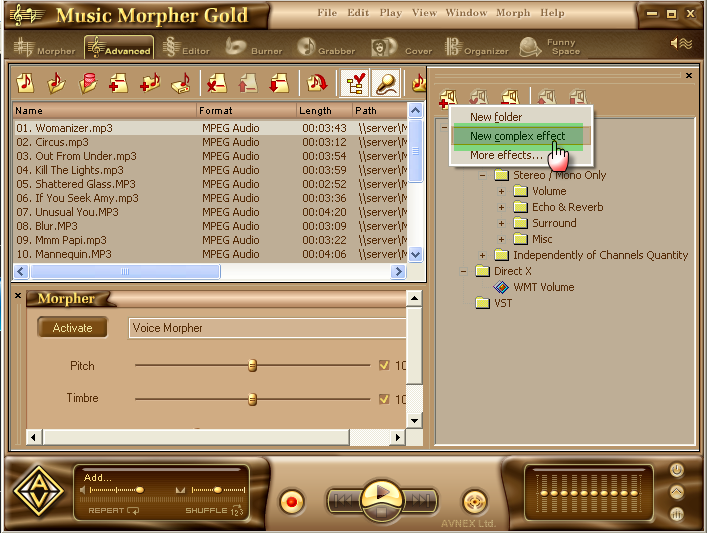 Learn more about AV Music Morpher 4.0. You can listen to the samples below as illustration. Just follow the steps below to get the best result. 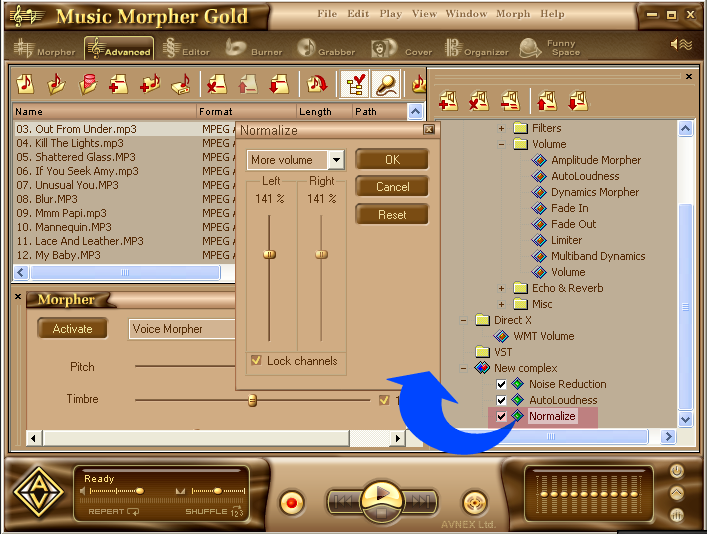 Click on Morpher tab on the module bar to open the Morpher. To open a file, click File on the menu bar and choose Open or Open From Library (1). 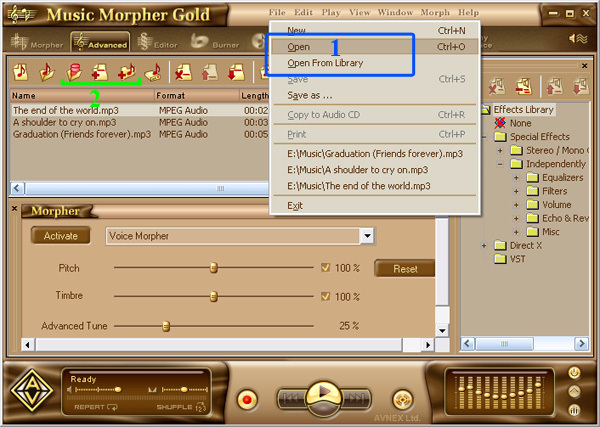 The Open dialog will come up, then select an audio file you want to open. You can also use Open From Library, Add Files to Playlist, Add Folder to Playlist button (2) on the toolbar to add a file to the playlist. Play the song by clicking the Play button on the Player panel. Remember to turn on the Equalizer to enhance the sound of music. You can adjust all bands to your taste or choose an available preset by clicking the Presets button. 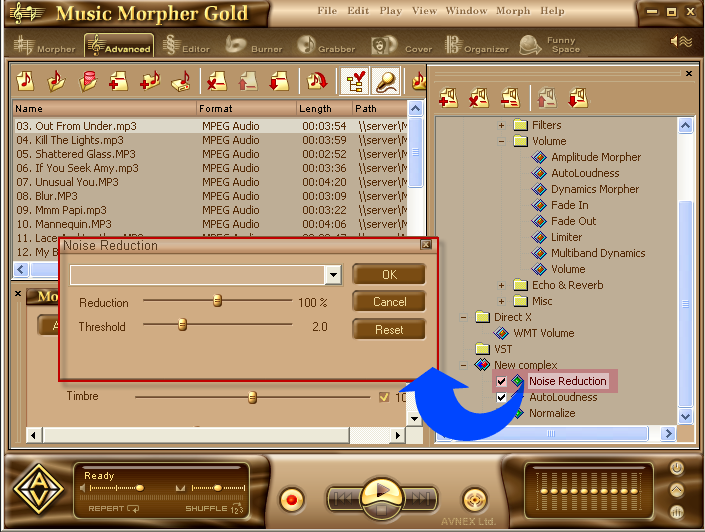 On the toolbar of the Effect panel, which is on the right window of AV Music Morpher Gold 4.0, press Add button and choose New complex effect. A new complex (1) effect will appear at the end of the effect tree. Right click on it and select Add new SubEffect (2). A list of special effects will comes up. Choose AutoLoudness, Noise Reduction and Normalize to add to the new complex folder. Note: In the Effects Library, just follow the paths below to easily find the effects stated above. Click on Noise Reduction and an dialog will come up. Adjust Reduction and Threshold to until you feel satisfied. Click on AutoLoudness and a dialog will come up. Adjust the Desired Volume and the Adaptation speed to the right level. Click on Normalize and the Normalize dialog will appear. Move the slider to adjust the normalization level. Check the boxes before the three effects. Then click on New complex to apply all these effects to the songs. There are several other effects that can help you improve the music quality, such as 2 Order Equalizer, 4 Order Equalizer, Volume, Surround, etc. Combine them for a better result. 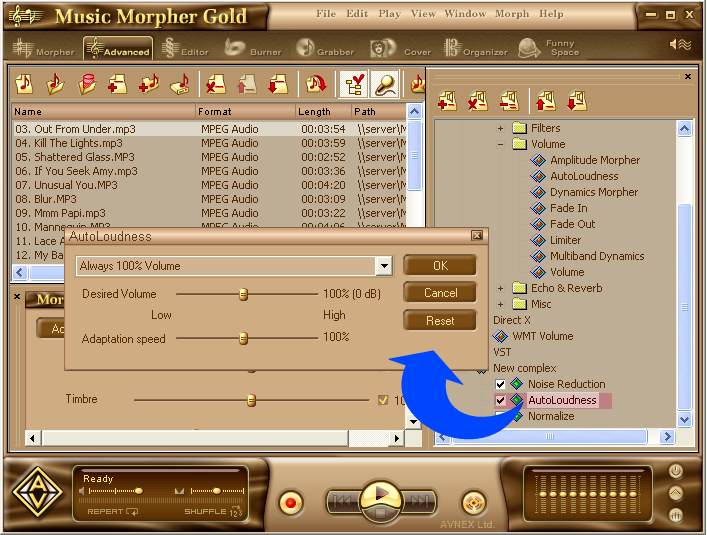 Learn more about AV Music Morpher 4.0.